Branch Rickey was famous for adding the “birds on bat” to the uniforms of the St. Louis Cardinals. Rickey, then Cardinals Vice President and General Manager, was invited to speak at the Men’s Fellowship Club of the Ferguson (Missouri) Presbyterian Church on February 16, 1921. Congregant Allie May Schmidt was tasked with creating table decorations for the event. Her decorations that night—cardboard cutouts of red cardinal birds, perched atop twigs made out of string—inspired Rickey. Rickey then commissioned Allie May’s father, Edward H. Schmidt—head of the art department at the Woodward and Tiernan Printing Co—to create artwork for the Cardinals’ uniforms. The rest is history. 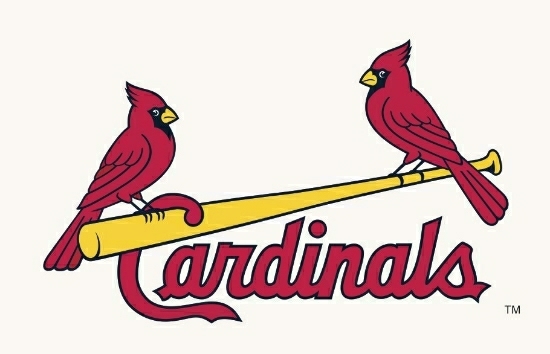 The two “birds on bat” have graced the St. Louis uniforms ever since then, with the exceptions of 1927 (when a single bird on bat celebrated the team’s World Series championship of 1926) and 1956, when the birds disappeared for a single season.